DES MOINES, Iowa - Police arrested more than a dozen Occupy protesters Thursday in Iowa who are targeting Democrats and Republicans just days before the state's closely watched lead-off presidential caucuses. Five protesters were arrested outside the Iowa campaign headquarters of presidential contender Ron Paul in Ankeny before the group moved on to the Iowa Democratic Party headquarters in Des Moines, where 12 more were taken into custody. All were ticketed for trespassing and released. The protests are part of an Occupy the Caucuses effort launched this week in Des Moines that has attracted activists from around the country. Many of them have promised to interrupt campaign activities, and organizers promised more confrontations on Friday with campaign offices of Republican presidential hopefuls. Occupy the Caucuses spokeswoman Danielle Ryun, who was among those arrested at the state Democratic Party headquarters, said the goal is not to be arrested. But since campaign officials won't listen to them, protesters are willing to be arrested to get their message across, she said. "It would be great if we could show up, issue our concerns and have the candidates acknowledge us and change their platform," she said. Those arrested in Des Moines included a 14-year-old girl who was released to her father at the scene. On Thursday, seven protesters were arrested outside Republican Mitt Romney's Des Moines headquarters. Iowa Democratic Party Executive Director Norm Sterzenbach said the protesters were given the opportunity to express their opinions and party officials listened to their concerns, but he said occupying the party offices was unacceptable. "Not only does it interfere with the important work that our volunteers and staff do to engage Iowans in the political process, by physically blocking our staff from entering or exiting the building sets a very dangerous precedent," Sterzenbach said in a statement. Protesters at Paul's campaign headquarters were protesting his proposal to dismantle the Environmental Protection Agency if elected. Ryun said the Paul campaign headquarters were locked when protesters arrived. By locking their doors, campaigns "are signaling to us that they have become disengaged," Ryun said. A telephone message left for a Paul campaign spokesman was not returned. 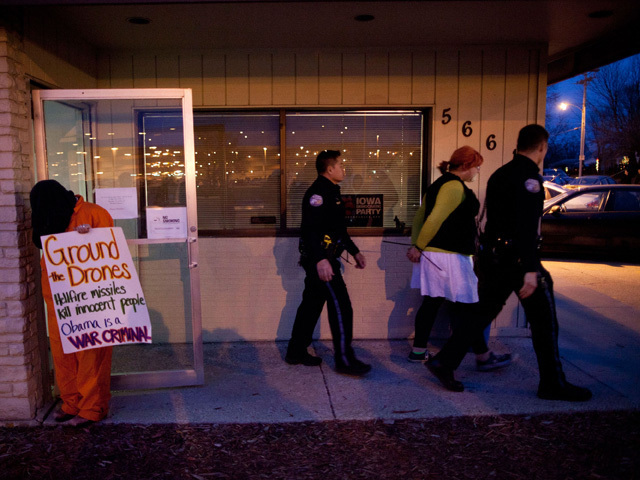 At the Iowa Democratic Party's offices, protesters targeted President Barack Obama, demanding that he put a stop to home foreclosures, turn down campaign donations from Wall Street, and end indefinite detentions of detainees at Guantanamo Bay. "They're all going to get equal play on this," Ryun said. "We are very disillusioned with every candidate." Eight protesters were arrested at the party's offices on Dec. 19. Police in Des Moines and Ankeny said the protesters were given the option of leaving and told if they refused they would be arrested. Police said the arrests were peaceful and no force was used. The Occupy movement began in New York and has spread across the country. Activists generally protest the growing gap between rich and poor and corporate influence over government.